Looking for a new printer for your home or small business? After a printer that is cheap on inks? The staff at Ink Hub have worked out the winners and we will attempt to explain why we believe this to be so. One of the most common issues we find when people go to buy a printer is that they tend to buy on impulse rather than doing the homework and actually assessing which printer will actually suite their needs. If I had a dollar for every person that's called our office having purchased a printer that either appealed to them visually, was cheap or was recommended by a sales person who was nothing more than a trained monkey I could have already retired. I know that sounds harsh and I mean no disrespect however we have been in the business for well over a decade now so surely by now we are qualified enough to make a educated decision on printer choices. One of the more obvious trends that most inkjet printers are adopting is the much larger volume Ink Cartridges. Rather than using the small individual cartridges which on average hold around 10-12ml for each colour and up to 25ml for black they are now using whopping big tanks which on average are colour 22ml and black a huge 72ml. Although the cartridges are huge, on a price/ml basis they still cost around the same price as the smaller cartridges used in similar inkjet printers. So what's the advantage of this style of printer? Here's where the rubber meets the road. There are two main printers we are seeing in Australia which are starting to take off in popularity. These are the Epson printers which utilize the large 786XL and 788XL cartridges and the Canon Maxify printers which use the large PGI 1600XL and PGI 2600XL cartridges. OK so here's where the biggest differences occur. All of the Epson printers utilize a Piezo Print Head where as the Canon printers use a Thermal Print Head. While the Piezo Print Head wins hands down for print quality they are renowned for clogging and also for failing (especially so with the modern Epson printers ). So which printer do we recommend? Due to the number of calls that we get from Epson printer owners who experience issues we NEVER recommend their printers. Canon or Brother are by far a much better choice and much more reliable. This is especially so when using these printers with Compatible Ink Cartridges. The thermal print head works extremely well with Generic Cartridges and in general will very rarely give issues with clogging etc. That is not to say that Epson and HP printers are no good with generic cartridges as they certainly work fine with them. It's jsut that if there is a brand of printer that will be troublesome it is more often than not an Epson printer. In regards to specific models which we recommend are the Canon Maxify iB4060, MB5060 and the MB5360. These printers are extremely economical if you are willing to use generic inks and they will work fine as long as the generic cartridges are quality ones. 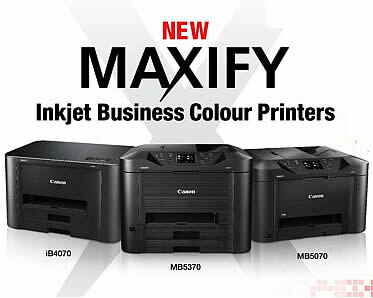 The Canon Maxify printers are not the cheapest Inkjet printers on the market however the running costs over the life of the printer will more than compensate for the initial purchase costs. If you are in the market for a cheaper inkjet printer for your home then consider any of the latest Canon Inkjet printers which utilise 5 individual ink cartridges. These are also very cheap to run and can be purchased from around $70 and upwards. For further advice on what printer to buy for your home or small office contact our friendly staff.